I must confess, I haven't read this book yet. I have, however, picked it up for my weekend read! So I thought I'd share with you:) Here's the blurb, and we'll chat on the other side! 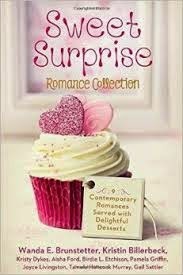 Join nine modern ladies on culinary journeys that lead to the recipe for lasting romance in this delightful collection, including New York Times bestselling author Wanda E. Brunstetter and eight other award-winning authors. When it comes to romance, will the sweetest treats be any match for God’s timing? Along with food, faith, and fun each story includes a yummy recipe for you to enjoy. I'm not even going to lie. What drew me to this book first was its cover. I was hungry, and who doesn't love a good cupcake? But then I noticed a few familiar names on the cover. That, along with the blurb, made me snap it right up. I tend to LOVE cooking shows. Baking shows, even better. And with the crazy schedule I have right now, the idea that I can start and finish a story before I fall asleep at night lured me right in. So, I plan on opening it tonight and reading one...or two of these. Hey, it's just like cupcakes, you can't stop at just one! Have a great weekend, friends! What a great idea for a weekend read. I'm in the middle of Heart of a Soldier by Belle Calhoune.